The greatest challenge to successful resettlement and relocation is developing sustainable livelihoods after people move to new sites. The THPC Social & Environmental Department works closely with resettled, relocated and host village families, offering support with a range of income-generating activities. As almost all households in the area traditionally rely on smallhold agriculture, optimising farming activities forms the backbone of livelihood efforts. The goal is to provide farmers with viable options to improve the nutrition of their families and to grow surplus produce that can be sold to raise income levels. Demonstration farms trial different crops and animal-raising techniques, and supply villagers with successful seeds, seedlings and young animals. Most resettled households are now growing vegetables and fruit trees in home gardens, and raising small livestock in the traditional way. These families also received upland plots, which were mainly used for rice in the first couple of years following resettlement. 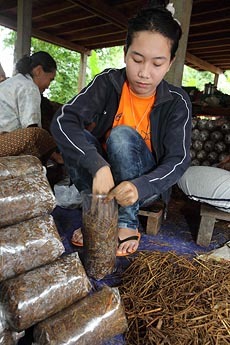 More cash crops are now being planted, including garlic, chilli and fragrant bark (bong) trees for incense. To ensure food security, additional rice support is provided to families who have problems growing enough rice. Two villages also have primary access to the valuable reservoir fishery, which offers great economic opportunity. 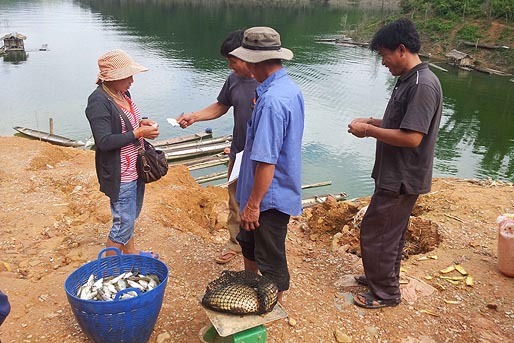 Residents of these villages are responsible for managing this resource, with THPC and the district administrations working with the villagers to establish Village Fishery Groups. Small businesses are growing in all the resettled and relocated villages as people take advantage of better communications and infrastructure, plus the increasing availability of surplus cash in the area.